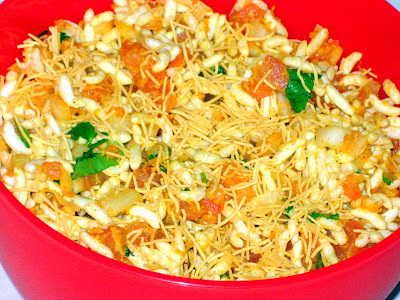 My mom usually makes this quick bhel at home whenever we long for something spicy and chatpata in the evenings. I had mentioned in an earlier post that we use the Masalya Pitto/Phova Masala for a variety of things. It finds its use in this bhel also. Try it once with this powder and you will know what I'm talking about. With this powder on hand, all you need is some Puffed rice (Chirmuro) and some readily available ingredients at home and you get to enjoy a fresh and crispy bhel. 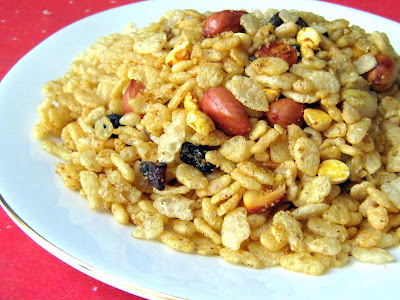 - Mix all the ingredients together except the puffed rice. 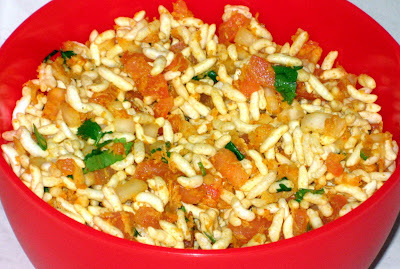 - Just before serving, add the puffed rice and mix well and serve. Sprinkle some fine Shev on it for extra taste. Can't get any simpler than this hanh ?? The picture below of my cooling rack with Biscotti is my entry for this months Click-Metal at Jugalbandi. A humble contribution to a wonderful event :).. I got this great recipe from my friend A. 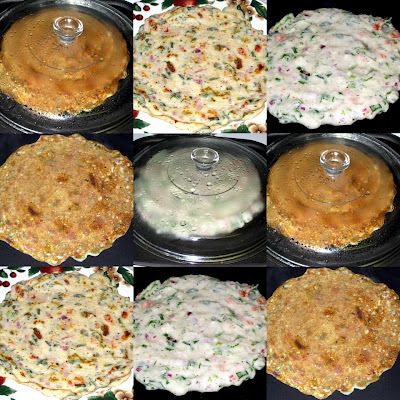 She said this is a quick way of making chuda and moreover its low calorie one. You can think of it last minute provided you have all the ingredients and it gets done in about 5 minutes.Saves you all the work of frying the poha to make it crisp and all. Plus the crispies are already ready, so just mixing the other ingredients is your job. - Heat the oil in a wide pan or kadhai, fry the peanuts and the Dalia and then remove them onto a plate. Add the mustard seeds to the oil, when they start spluttering, add the jeera, curry leaves, hing powder. Turn the heat to very low, add the turmeric powder, poha masala, sugar, salt, raisins. Add the peanuts and dalia to this. Mix all well. 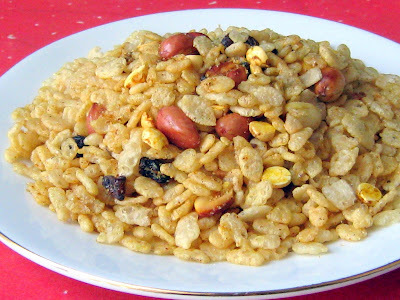 - Add the crisp rice cereal to this and mix everything well. Turn off heat. - Cool before storing in airtight container. P.S: If you do not have Poha masala, you can just add chilli powder, some fennel and coriander powder. This is something which I have grown up with as a child, during my summer vacations at my native. 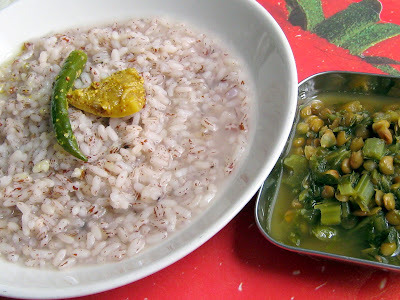 At my grandma's, there was a tradition of having Paej as a mid-day meal. Yes, breakfast would be done latest by around 7.30 am and then the Paeji Javan (Javan means meal in konkani)would be around 10.30-11 am. We used to have this with any of the side dishes or gravies which would be ready for lunch. We would sprinkle little salt over the Paej. Kids were forced to have this topped with ghee. I used to detest it then. But loved drinking the starchy water (called Nishe) from it and the delicious sides that accompanied it. I would opt mostly for Papads and pickles with it. I like Paej which is made with red boiled rice(Ukado Tandul)only...Somehow, can't eat the one which is made with regular white rice. So, where did I get this rice from ?? Hahaha, I had carried 1lb of rice from back home when I went last time. I get these sudden pangs of eating this Paej sometimes, that my mom is aware of. And one of our relatives gave me this freshly milled rice. So my mom just insisted that I carry a little. I had completely forgotten about it, and then found it during a cleaning session. So, din't waste a chance. Am I crazy or what ;)?? I just love garlic and there are loads of recipes and everyday cooking in which I use garlic. 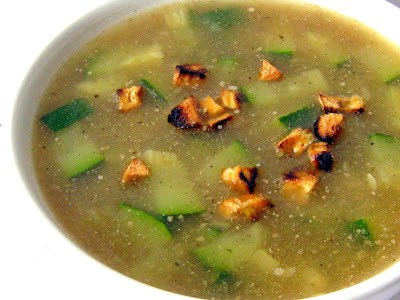 But this soup recipe that I tried from sanjeevkapoor.com just packs in the flavour, and is a creamy, filling soup. Especially good when you have a cold and sore throat and long for nothing more than a big bowl of hot soup to soothe you. A must try, first for the flavor, and then for the simplicity. I'd like to send this an my entry for JFI-Garlic hosted by Mathy. - Heat olive oil in a pan, add three-fourth of garlic and cook over medium heat until it turns light brown. - Add onion and cook for another five to six minutes till the garlic is lightly burnt and onion turns golden brown. - Add potatoes and continue to cook stirring all the while. - Add chicken stock (or water), salt and black pepper powder to taste. Once it comes to a boil, lower the heat and let it simmer for half an hour. - Take it off from the heat and let it cool slightly. Then, make a smooth puree in the blender. 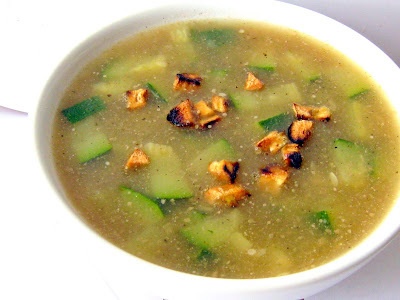 - Now, heat the puree and when it comes to a boil, add the zucchini pieces and cook till the zucchini is cooked and tender. Add stock or water, to adjust the consistency. - Toast the remaining one-fourth garlic in oven, or on a tawa till golden in colour and crisp. Garnish the soup with this and serve piping hot. - Preheat oven to 300F degrees C.
- Sift the flour, salt and baking powder. - Beat the oil with the sugar. - Add the vanilla extract and eggs & beat well. Stir in the flour mix. 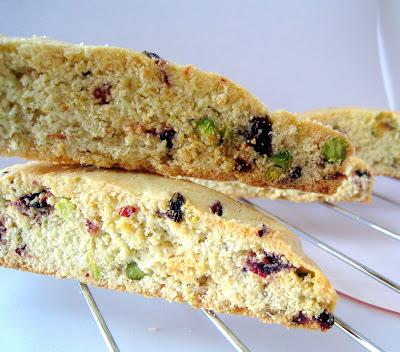 - Now, gently fold in the the pistachios, cranberries and raisins till its well combined. - Transfer the dough to your baking sheet lined with parchment paper and form into a log, about 12” X 3 ½”. Since the dough is very sticky, so you may have to dampen your hands to form the log. - Bake for 35 minutes, or until firm to the touch & light golden brown in colour. - Then, remove from the oven and cool for about 10 minutes.Transfer the log gently to a cutting board and cut diagonally into 2 cm slices with a sharp serrated knife.Reduce oven temperature to 275F. - Place the biscotti, cut side down, on the baking sheet. Bake 8 minutes, turn slices over, and bake for another 8 minutes or until golden brown. - Remove from oven and let cool. Store in an airtight container. 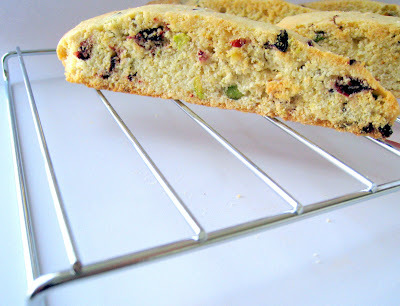 - This makes about 20 - 24 biscotti. Enjoy the yummy biscotti with tea, or just like that. 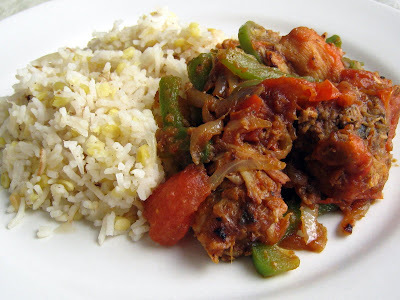 Country Captain, as the name suggests is an Anglo-Indian chicken dish which originated in Calcutta and has stayed there. This is an easy to prepare dish which disappears even sooner. Serve it with plain rice, or rice khichdi, it tastes just excellent. I served this with the Khichuri ( Khichdi), a nourishing mixture of rice and moong dal. Both of these dishes are taken from the book, ‘Flavors of India’, by Madhur Jaffrey in her section of West Bengal cuisine. 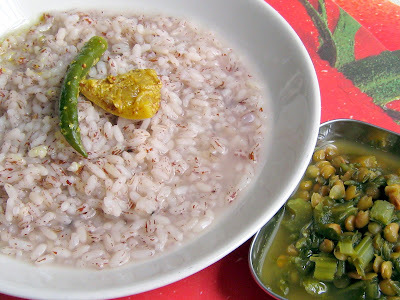 This post is my contribution to RCI-Bengal, hosted by Sandeepa of 'Bong Mom's Cookbook'. Green bell pepper, cored and seeded – 1, finely sliced. 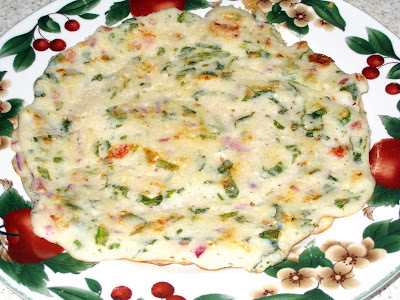 - Put the ginger, garlic and onion for the paste into a blender and make a fine paste. Keep aside. - Heat oil in a large, wide and preferably non-stick pan over high heat. - When hot, add half of the sliced onions and fry till they become soft. - Add the chicken pieces and stir-fry for 8-10 minutes until browned. - Now, reduce the heat to medium and add the ground paste, chilli powder, salt, sugar and vinegar to taste. Stir and fry for another 15 mins until the chicken is tender and the raw smell from the paste goes away. The sauce should be thick enough that it coats the chicken pieces. 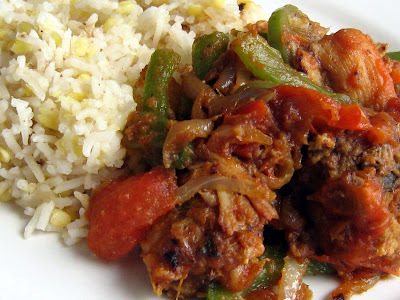 - Now, add the remaining onions, cut tomatoes and green pepper and green chillies. - Stir and fry for 3-4 mins so that the flavors blend in but the peppers remain green and crisp. - Wash the moong dal in several changes until water runs clear and keep soaked in water for 3-4 hrs. Drain. - Wash the rice in several changes till water runs clear and soak in water for about 30 mins. Drain. - Heat ghee in a heavy, medium sized pan and add bay leaves, cloves, cardamom, and cinnamon. Stir for few seconds, then add the onions and fry till they get browned. - Add the rice and moong dal and stir for a minute. - Add 2 ½ cups of water. Bring to a boil on high heat. Cover tightly, reduce heat to very low and allow to cook for 20-25 mins or until rice is done. Stir gently before serving. 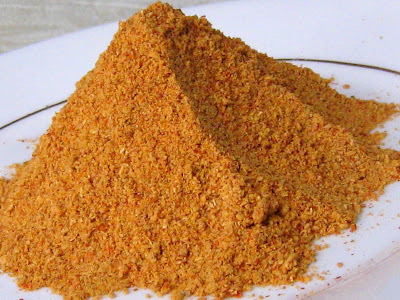 Another must-have or rather a powder which most Konkani's will have is the Kolombya Pitto. 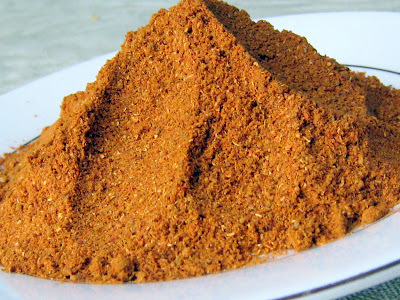 Kolombo is the name for sambaar and pitto is powder. Coming to the powder first, here is the recipe. - Dry roast all the ingredients separately (without oil), except haldi powder. - After cooling, powder all together ( including haldi) in a mixie until fine. - Store it airtight container after cooled completely. International Women’s Day is March 8th and Zorra of Kochtopf has organized an event where we cook or bake something Yellow for this special day. “Yellow because on this day in Southern countries there is the tradition to give sprigs of bright yellow Mimosa flowers to women. The flowers are intended as a sign of respect and also an expression of solidarity with the women in their support for oppressed women worldwide.” How thoughtful and nice can this event get, isn’t it ?? I came to know about this one at Asha of FoodiesHope, and thought the least I could do was to make a dish with something yellow and post it. So here goes, Pineapple Pasta Salad is my contribution to the event. Pineapple chunks – 3/4 cup, canned ones ( I didn’t have, so used crushed pineapple). For the dressing, combine all the ingredients mentioned for dressing in a jar with a lid and shake until well mixed. - Cook the pasta according to package directions, drain and rinse with cold water. 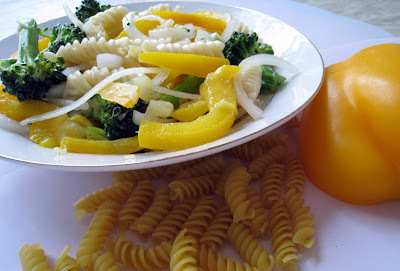 - Microwave the broccoli and bell pepper separately on high for 1 minute. 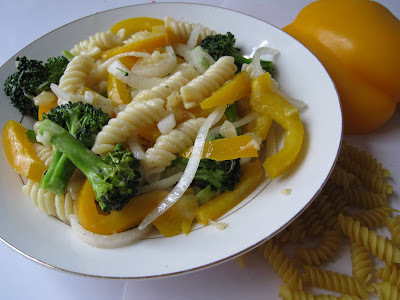 - Now, in a mixing bowl, combine the pasta, broccoli, bell pepper, onions and pineapple. - Pour dressing over it and combine well. Refrigerate until serving time. Time sure flies fast. My son just turned 4. I think this is the age where they look forward to treats and celebrations. Treats for kids in class, which should be non-messy, no-frosting ones and better if healthy, like I mentioned in an earlier post. Well, wanted to try these absolutely great 'Bar cookies' as Deeba called them ever since I saw them at her amazing blog. I also had my eye on those yummy Tutti-frutti cookies that Purnima made sometime back and was waiting to bake them ever since. Thought these two would be a great snack to send to school for Divit's B'day...Was difficult for us to keep those few from goin to school, so that explains how good they tasted :)..Thanx so much Deeba and Purnima for sharing these excellent keeper recipes with us. For the Bar Cookies or I'd like to call them Fruit bars..
- Preheat the oven to 350F. Line a baking dish with a 2" depth ( I used 8"X8" ). - Sift the flour, baking powder and salt together and set aside. - Beat the butter and sugar until light and fluffy. - Beat in the eggs one by one and then the vanilla essence. 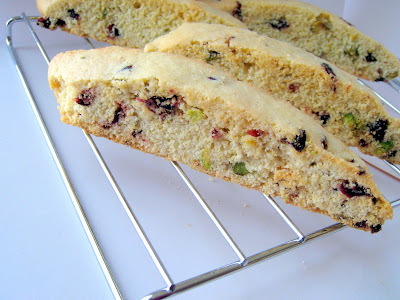 - Then, gently fold in the flour mixture, ground almonds, cranberries, pistachios, dates and raisins. - Put the batter in the baking dish and level out evenly with a spatula. - Bake in oven for 25-35 mins until brown on top or till knife inserted comes out clean. Mine took 25 mins to bake. - Cool completely before cutting into pieces and then dust with powdered sugar. P.S: Pistachios are the best thing in this bar as per me, just tastes divine..
- This is best stored in refigerator ( as per Deeba's note).. I cheated here in taking a short-cut and buying the store-bought ready-to-use cookie dough. Plus, she said that in the recipe from Pushpa, it was mentioned we can use a combination of dried fruits in this. So I did that. I have a history of destroying cookies, so due to lack of time, didn't want to take a chance with them. Well, I didn't spare the ready-to-use dough also, the first batch was a disaster. I know myself too well now, so had bought extra ;)..Learnt a lesson from the first batch and then tried the second one. Absolutely great tasting cookies, got a great feedback from the class and the teacher. So Purnima, all thanx to you for sharing this excellent recipe with us. For the actual recipe followed by Purnima, check here. 1 1/2 cup of dried fruits which included dried cranberries, pears, apples, raisins, apricots and peaches - Finely chop all these. - Slightly break the roll of dough, add all these chopped fruit pieces in it. Mix well till all the fruit is uniformly distributed in the dough and knead. - Out of this, I made 2 thin cylindrical logs, rolled it in a sheet of plastic wrap and chilled it in the refrigerator for about 3 hours. (this dough was already refrigerated when I bought it, so didn't take much time to chill and set again). - Then, once firm and chilled, slice the logs into rounds and place these on a baking sheet lined with parchment paper. - In a preheated oven at 350F, bake for about 10-13 mins, or until the cookies turn light brown. - They will look light brown on the edges and slightly undone in the center. But they will harden on cooling. - Cool completely before storing. Also, a big thank-you to dear Purnima and Dhivya for passing on this lovely award to me. Really kind of you girls to think so of my blog, but I think I have a long long way to go. Thanx so much, and I am really honored for your thinking so. This might be a common recipe which many make, but I find this as a great comfort food, which is simple to make, very tasty and at the same time can be varied by adding different kinds of vegetables or just plain by itself. Serve it with rotis or have it with dal, its an absolute winner. - Wash the lentils and pressure cook with enough water for 2 whistles. - Heat little oil in a non-stick pan, add the cumin seeds, then add onions and fry till translucent. - Add the tomatoes and fry. Add salt, turmeric powder, red chilli powder, coriander and cumin powders. Mix well, fry for a min and add the methi leaves. Fry well till methi leaves become tender and wilt. - Add the cooked dal to this, add water to adjust the consistency, add the garam masala powder and boil till done. - Add lemon juice(if using) at the end and put off stove and mix well. 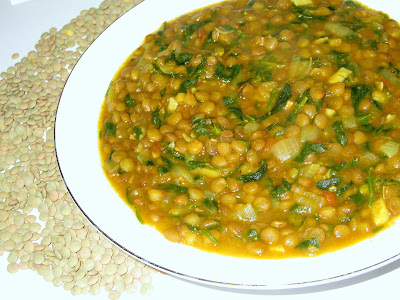 - Serve hot with plain or jeera rice or rotis. I make various versions of this, like using spinach, mustard greens, ridge gourd, bottle gourd, mango or just plain. 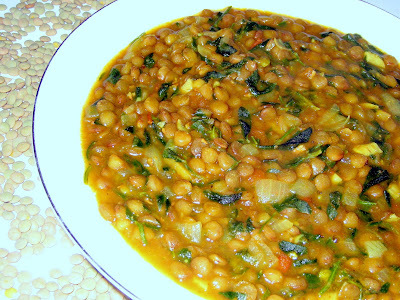 Its a very quick, healthy and nutritious dal.